Something special happened last week. 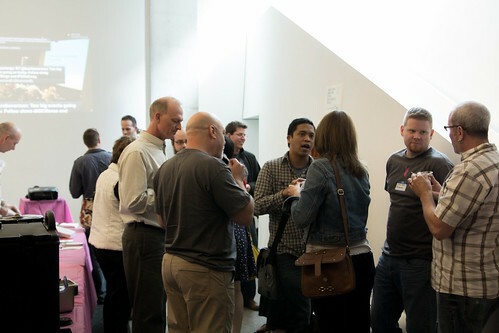 A 1st-year conference gathered over 80 people in a funky downtown space for two days of learning, friendships, and inspiration. Queen City Merge was, in my opinion, a success. No, it wasn’t perfect, but as a 1st-year conference it can only get better. The conference ended on the Reds party deck at Great American Ballpark. As I left I felt a lot of energy, but also a bit of sadness like when vacation comes to an end. 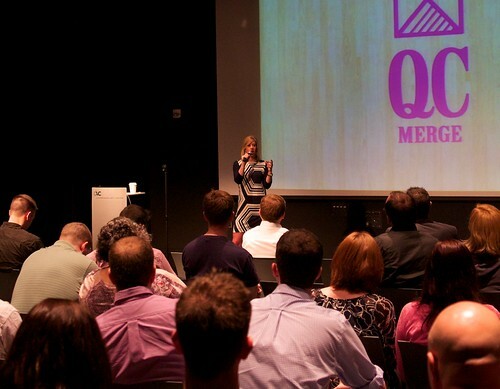 QC Merge was chartered to bring together folks from diverse web disciplines (hence “Merge”) to show how much talent is in Cincinnati for building web companies. At the least, it got people talking. After the end of Jen Myers talk “Developers Can’t Design and Other Myths,” a rabid discussion ensued about why developers and designers don’t get together more often. Why don’t developers congregate over here? Why don’t designers congregate over there? Should they congregate professionally or at a happy hour? Cincinnati’s a good city for cross-pollination. Cincinnati’s a bad city for cross-pollination. Jen’s talk was followed by Alex Hillman. Now, if you’ve followed coworking at all over the past few years, you’ve run across Alex’s name. As co-founder of Indyhall in Philadelphia, he’s helped create one of the most successful coworking spaces in the nation (note I didn’t say largest, richest, or loudest). Cross-pollination of ideas, creating community, gathering diverse folks – Indyhall breathes these ideas and the QC Merge debate was like a coworking values game of Scrabble™. As a web developer, I am fairly active in the local developer communities. I attend the user groups, hackathons, and happy hours. You know what I find there? Other developers. When I look at the local AIGA chapter’s roster of events, I see all kinds of events. Same for the AMA, and the Adclub. There are lots of developer events. There are lots of designer events. And there are lots of marketing and ad events. How is it that someone like me who loves going to developer events has never encountered someone from the these other groups (not until recently at least)? How is it that it takes a two-day conference to start the conversation? We want Cincinnati Coworks to be a big part of this conversation. I ask AIGA Cincinnati, Cincinnati AMA, and the like to be a part of it too. We all want the same thing, and we’ll get there faster together.